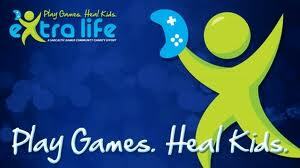 My first time participating in the Extra Life 24 hour gaming marathon was a huge success! Not only was I able to stay awake and play games for 24 hours, but more importantly my goal of $1000 in donations was reached. Thank you so much for contributing! I had a decent list of games to play from everyone who donated and was able to get to all of them for some period of time. I even had to spend time failing at Dance Central...sigh. I used a big chunk of time Friday evening and Saturday morning to play co-op with my son, which is one of our normal routines. There was a great mix of games,old and new, so I had a really great time overall.